Today in iOS (iPhone) is the original iPhone Podcast and has been produced weekly since April 2007. A typical episode will have over 30,000 unique downloads - with some episodes getting well over 40,000 unique downloads. In addition there is another 1,000+ streams via Stitcher Radio per episode. We have both in show Audio ads and on site banner ads available. Option 2 - Up to 60 second host read ad for one episode. Option 3 - 300 x 100 Side Banner for 1 Month and 60 Sec ad in one episode. Option 4 - 300 x 100 Side Banner for 1 Month and 60 Sec ad in two episodes. To learn more about pricing for these and other options send an email to todayiniphone@gmail.com. 1. Today in iOS has the right to refuse any ad campaign for any reason. 2. Advertiser will email the banner image to us along with the outbound URL. Embed code for an image will not be used. Today in iOS will host the image on our servers. Banner must be jpg or png - NO animated gif or images. 3. Outbound URL can not link to anything sexual in nature or to any medications. 5. Outbound URL can not link to site that has malware or other security issues. 6. Outbound URL can not be for a service "selling" unlock or jailbreaking services. 7. Any change to items 3 thru 6 during the campaign will result in immediate pulling of the banner - with NO refund. 4th of July Weekend Sale = Free Shipping + $119 Gift Card which can be used for $149 Clamcase. I know you love your iPad - I love mine too. But one of the biggest complaints on the iPad and iPad2 is that sometimes if you are doing a lot of typing a real physical keyboard is just needed. Sure you can get the Apple Bluetooth keyboard - but taking that with you or remembering where you left it can be an issue. Plus getting the iPad in the perfect position to watch a movie or type a document can also result in some less than ideal solutions or a sore neck. However, the folks at ClamCase have come up with the perfect solution. They have created an all-in-one keyboard case and stand for the iPad and iPad 2. Why not check out this amazing product for yourself? It really is the perfect solution for bridging the gap between your iPad and laptop. 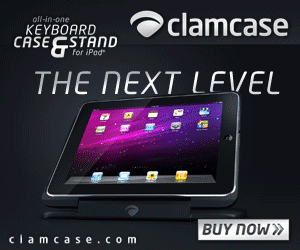 ClamCase® Is the ultimate all-in-one keyboard case & stand for your iPad® and iPad® 2. Increase your productivity with ClamCase's multiple viewing angles and full Bluetooth keyboard. ClamCase gives you the mobility, functionality, and portability of a laptop in an all-in-one package. The following are some of our more popular past blog posts. Today in iOS (Formerly - Today in iPhone) - Tii - was the first Podcast dedicated to the iPhone. The Podcast launched in April 2007 and we have been producing new episodes about once a week for over seven years. The podcast regularly gets between 25,000 and 30,000 unique downloads per episode. The show can also be found on Stitcher where it gets another 2,500 listens per episode. The show and site are dedicated to the iPhone OS and any and all devices running the iPhone OS. This includes News, Tips, Tricks, Apps, Accessories, Rumors, Jailbreaking, and anything else we feel fits with the iPhone OS universe. The show is G-Rated and you will never hear a curse word on the show - so it is ok for your kids to listen. We work hard to integrate listener Voicemail and email into each episode, this can be questions, tips, tricks, reviews and even rants. As of 6/10/2011 - I own Stock in Apple and hold a long position. As of 5/17/2014 - I also own Stock in Facebook, Tesla, Twitter and GTAT and hold a long position on all of them. Full and Fair Disclosure is something we believe strongly in. We do not take any money to do App reviews, we do accept free promocodes for Apps and free gear to review - but will always disclose if a promocode or a product was given for free. We openly welcome App reviews from our Audience including reviews by the developers (as long as they disclose they are the developer). We do our best to vet reviews to make sure they are not coming from a PR company hired by a Developer. We expect full and fair disclosure from our audience as well. Developers are welcome (encouraged) to advertise on the site and/or Podcast and we clearly state on the podcast when the show is being sponsored by anyone. The banners at the right side of the site are sponsored by those in the banner. To learn more about advertising opportunities click here.